Pound the chicken to flatten. Soften Brie in microwave; in a medium bowl combine the Brie, green onion and garlic and mix together. Spread about 1/4 cup of this mixture onto each chicken breast half. Roll up and secure with toothpicks. Combine egg beat and water in a small bowl and whisk together to make egg wash. Place toasted pecans in a shallow dish or bowl. Dip each chicken roll in egg wash, then roll through the pecans, coating on all sides. Heat oil in a large skillet over medium high heat and cook chicken rolls for 15 minutes, turning to brown on each side. When browned, cook for an additional 15 minutes, until cooked through and chicken juices run clear. To Make Raspberry Sauce: Meanwhile, place raspberries, sugar and water in a blender. Blend for 3 to 4 minutes, then pour through a sieve to remove seeds. Remove cooked chicken rolls from skillet to paper towels to drain. 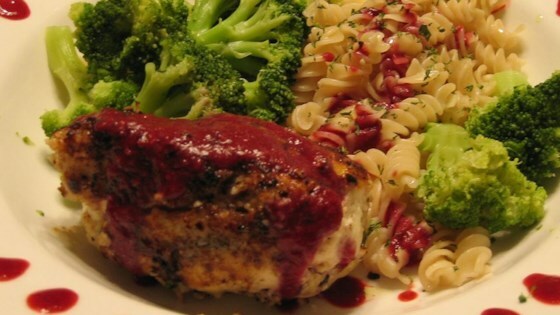 When drained, transfer to a serving plate and drizzle with raspberry sauce. Drizzle some sauce onto the plate in a circle, and serve. We liked the taste of this alot - but make sure you crush the pecans good, they didn't stay on the chicken well, and make sure you wrap the chicken around the cheese well or it will leak out. Made this with less cheese and less onions...pan fried for 15 minutes than in 350 degree oven for 15 minutes. It was really great. Dinner guests said they had to have recipe. Interesting and fun flavors - a dish for those with a sense of adventure. Definitely use less cheese and green onion than the recipe calls for, or there will be a lot of it left over.